I am an Oregonian through and through. I was conceived and raised in Williamina, population 1100. I attended Oregon State University for my undergraduate degree, got it, then started a family. 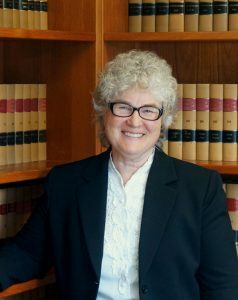 Once my two boys were launched into the public school system, I returned to school, the University of Oregon School of Law, graduating in 1985. The U of O did its best to convert me from a Beaver to a Duck. The efforts failed. I remain a Beaver in a Duck town. I do, however, root for the Ducks when they are not fighting the Civil War. I worked as an assistant City of Attorney in Corvallis for a brief time before I moved to Eugene and went to work for the firm which is now Moore & Jensen. Twenty-five years later, I am still here. I have thousands of cases under my belt, and I still love what I do. Helping the “little guy”, who got hurt on the job, fight for everything he can reasonably get out of the insurance company is the best part of my job. Both of my sons graduated from the U of O and married other Ducks. I am fortunate to have two great daughters-in-law. Both have finally produced some grandchildren for me, whose pictures pepper my office. While waiting for the grand kids, I adopted two additional kids who are now 16 and 13, a girl (my first) and a boy. My family, every single member of it, is very important to me. They make my life complete. Why law? I have always liked competition, a good fight. This can be confirmed by asking my brothers. They barely made it to manhood with their bodies intact. Why Workers Compensation and Social Security law? I am, at my core, a hard worker, a blue collar worker. I want to help the other worker bees of the world. I come from a long line of loggers and builders so, no surprise, I like building as a hobby. One of my sons and I built the house that he and his family now live in. It took us five years of spare-time effort to get it done, and I then moved on to remodeling mine and building high chairs for my grandkids. I am nothing if not persistent, a good trait for your lawyer to have. I look forward to putting my persistence and experience to work for you.